Add verticality and traditional style to your summer with this beautifully handcrafted hanging two-flower hitch. Hang flowers, herbs, and much, much more in any blooming space - decks, patios, gardens, even outside a business or porch - and watch as the hitch keeps the pots perfectly balanced and looking their best. 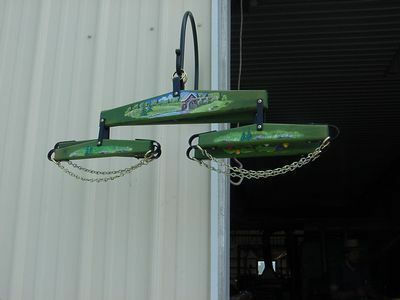 Additionally, the woodworkers who craft these hitches will happily decorate your hitch with your choice of mural. Choose your mural and color from the list below to customize your hitch and make it a truly unique addition to your outdoor space. If you have any questions, please don't hesitate to get in touch at 1-866-272-6773.